Finally! I managed to squeeze out sometime today to make something in support for this month's MFF, featuring Johor. 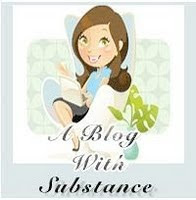 Must support must support...many of my blogger friends doing it, so must give face, lol! 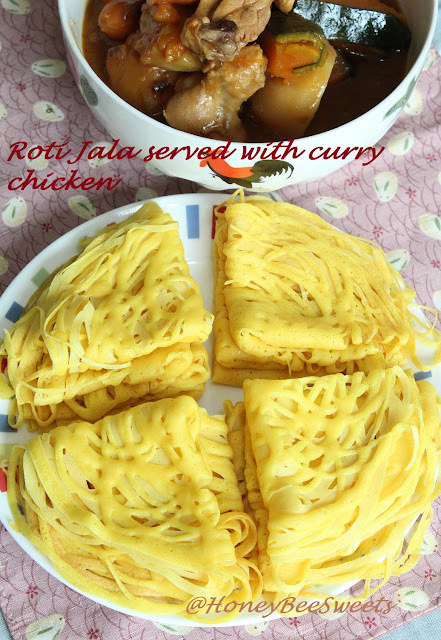 Since I was pressing for time, I chose one of the easier recipes to tackle, which is of course Roti Jala. Although I still had to cook the curry to go with it, it was still worth the effort when you dip and bite that first mouth, yummy! Actually I had quite a lot of fun making these thin crepes...even my little one was very excited and helping me out, haha! 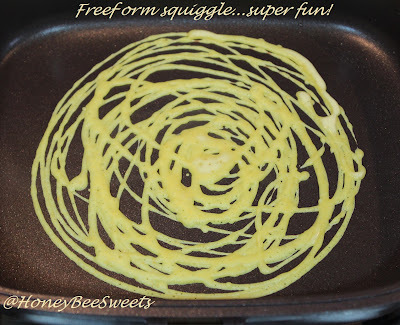 :D It's like free form crepe making...squiggling the batter around the pan, haha! 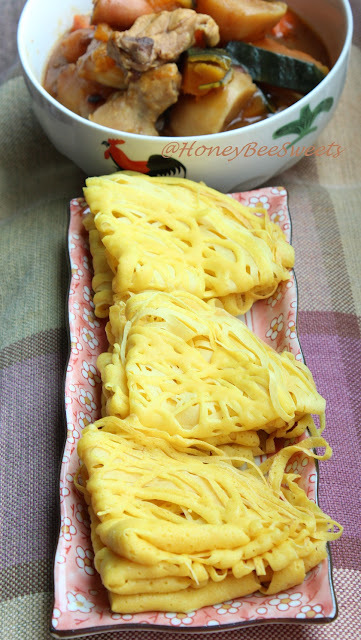 And since I did not have that special roti jala tool that helps drizzle the batter, I used my handy dandy squirt bottle, heehee.. In a large mixing bowl, beat the eggs and coconut milk together till well combined. Sift in the plain flour and salt and stir well with whisk till it is completely incorporated and forms a thin batter. 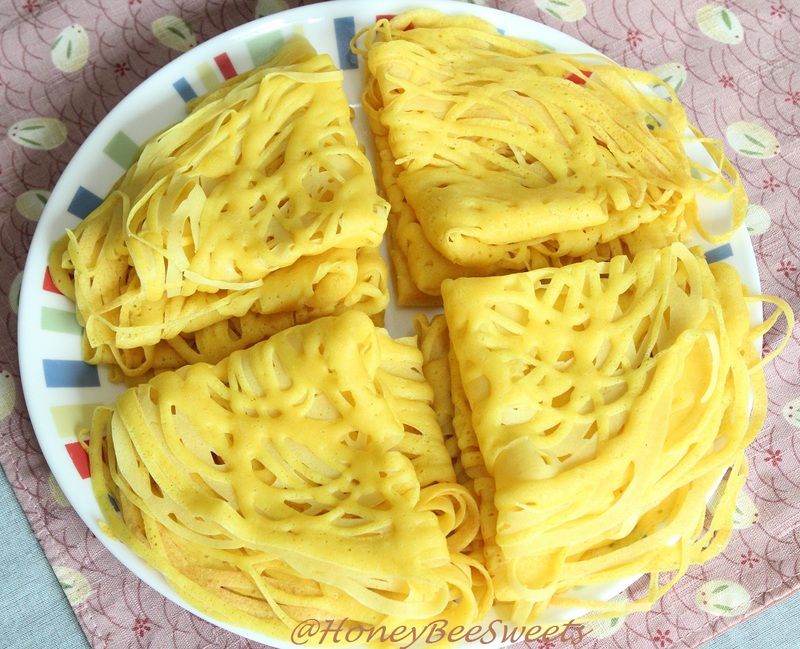 Strain the batter through a sieve to catch any lumps, but you can skip this step if you have the roti jala tool, seems like those that uses it has no problem not sieving. 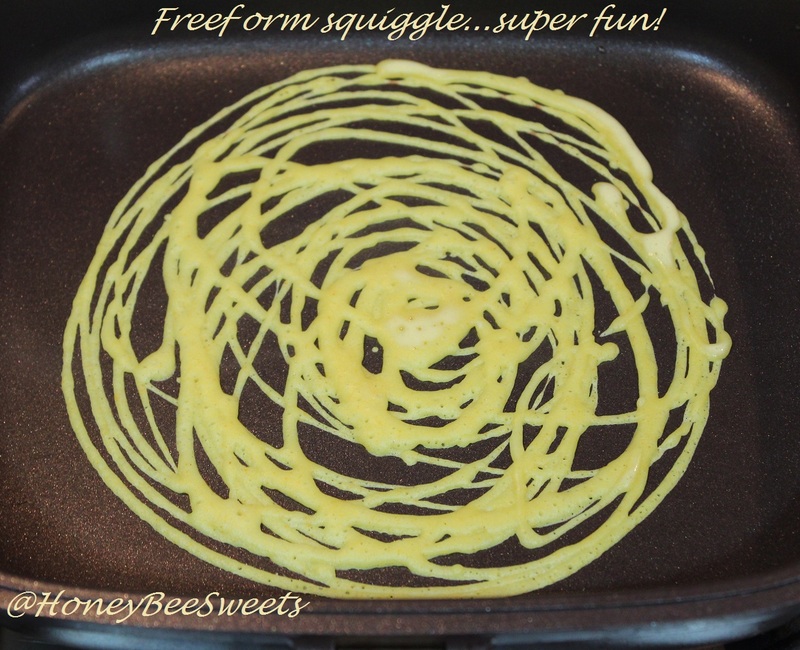 Heat up a pan at medium low fire, and squirt batter over it...at free form! It takes only 20 to 30 seconds for one of these thin crepes to cook, so be watchful. And you do not want to over cook them as they become crispy...which I think will be hard to fold later. Once you see the surface starts to dry out, quick dish out. There is no need to cook the other side...I find the texture just right . Repeat until all the batter has been used up. Serve while still warm with curry of your choice. Yummy! 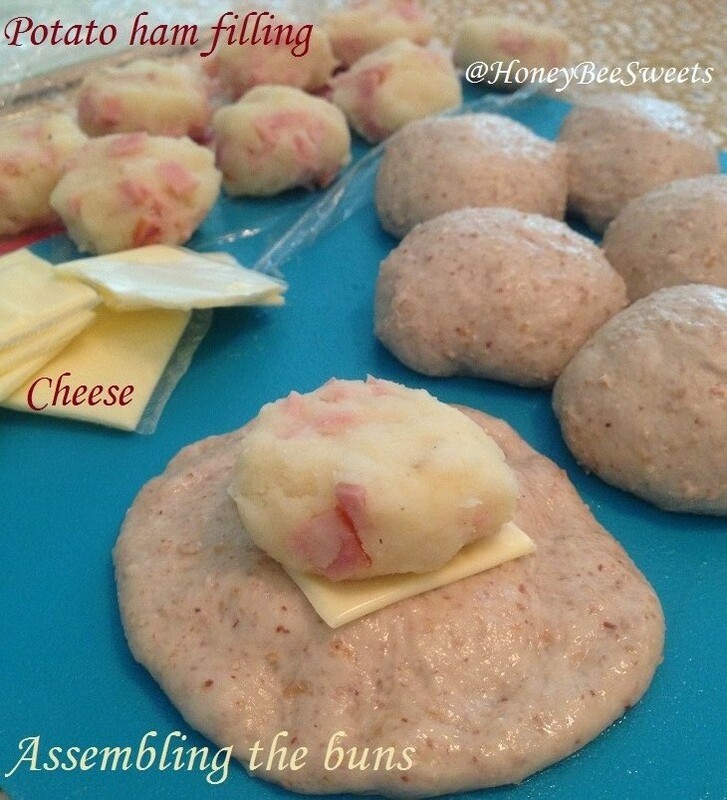 If you ever hesitate about making this, don't! 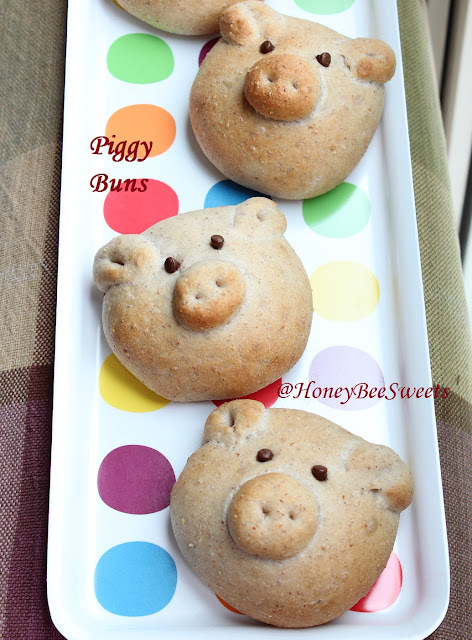 This is such an easy recipe to whip up, I'm serious...not to mention the fun I had too, haha! And when you dip into that creamy, spicy curry, it is awesomeness to the max!! You can opt for a healthier version by using only fresh milk instead of coconut milk but bare in mind it will not be as fragrant. I love how the tumeric powder gave it it's light golden shade....and thankfully it didn't contribute much taste to it, else my little ones will be complaining, haha! And you see those yummy pumpkin chunks in my curry? Those are the bomb! It's Japanese pumpkin, slightly expensive but so sweet and smooth....so glad it went well with my chicken curry. 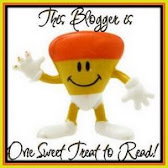 Make sure you add some pumpkin too next time if you are a pumpkin lover like me, heehee! Okay, I am super happy to finally submit this one post to this month's Malaysian Food Fest ( Johor Month ) hosted by Annie of Annielicious Food. Yay!!! Have a great weekend everyone...before it's over! Cheers! When you have that 2 or 3 overly ripe bananas in your kitchen, "looking" at you every time you walk pass. You know it ain't that tasty anymore since it's too ripe and mushy when you peel it. And kept emitting that ever so fragrant banana scent, telling you it's now or never! Never because it might just rot before you can get to it. :P I am sure everyone of us experience this all too often! Well, as I always say, there's never enough banana recipes to go around! 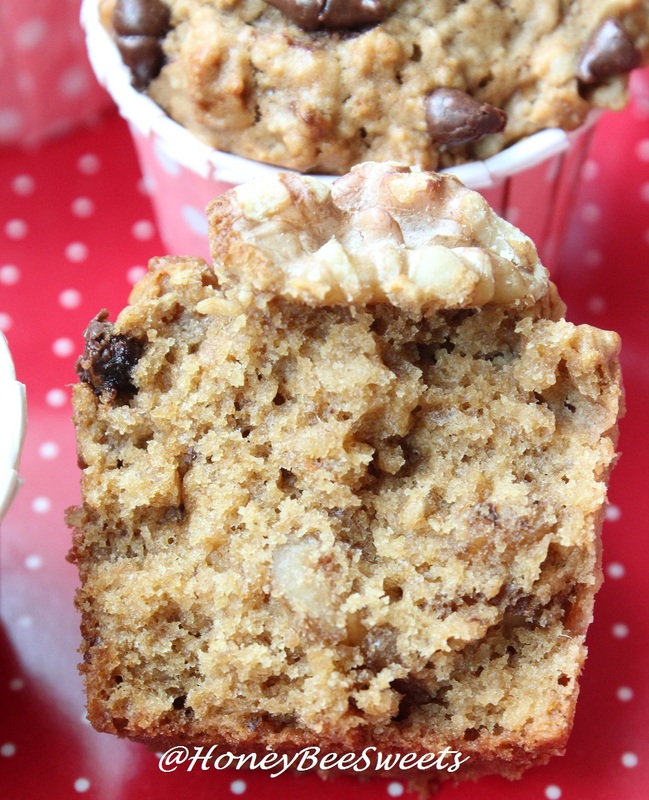 So here I am again, after trying to justify why I am posting this yet another banana cake recipe on my blog, (busted! lol!!) 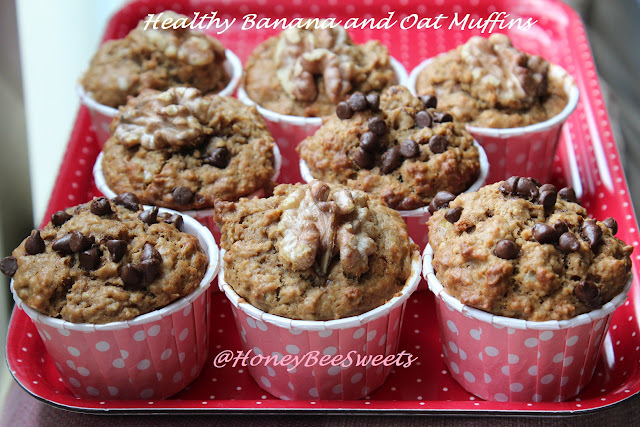 share with you this wonderful and healthy muffin cake that you will not feel guilty chowing down 2-3 of these babies. Preheat the oven to 175C. Line muffin tins with paper liners. 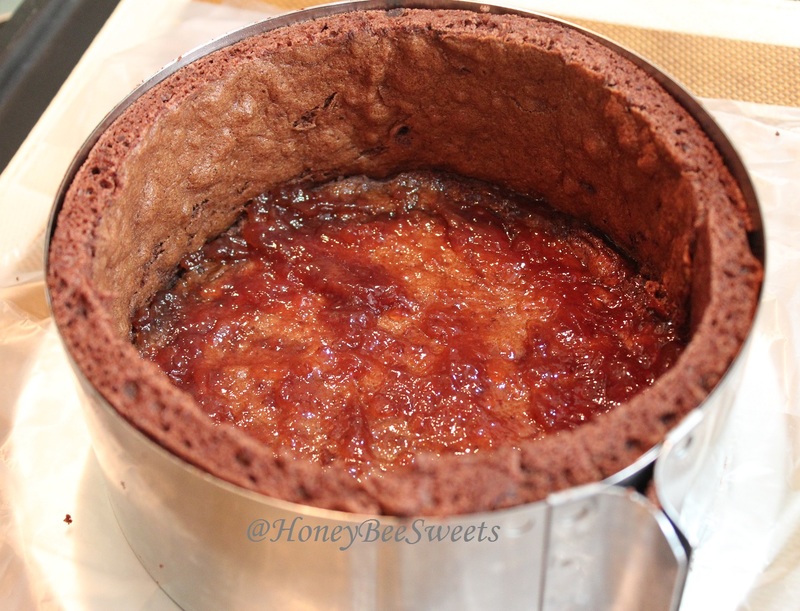 In a large mixing bowl, beat the oil, egg and sugar together till brown sugar has melted. 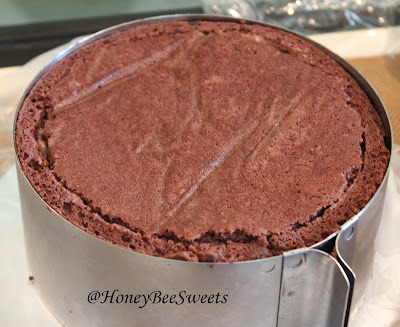 If sugar did not melt properly, place mixture over double boiler to help speed up the process. Add milk, vanilla extract and salt and stir well. Sift in cake flour, baking powder and baking soda and stir well. Add in walnut and chocolate chips in desired and stir to mix. 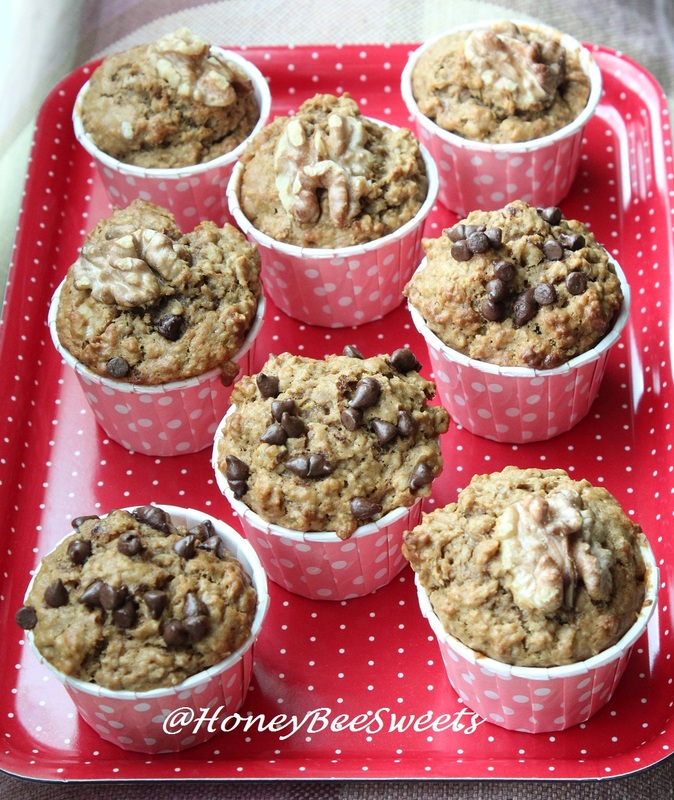 Scoop batter into muffin cups or baking trays. Bake in the oven for 15-18 minutes till tester comes out clean. Have a good evening then everyone! As promised, I will post up something before the crazy new school term starts again. I'm actually setting my kids "free" today since it's their last free day...so they are basically doing whatever they want. Playing 24-7. (~.~") Have to keep reminding myself, you only get to be a kid once. 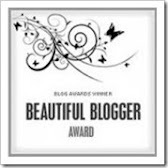 :P And because of that, I have some free time now to blog, lol! Today a simple and yet healthy recipes that I am so sure anyone can do it in jiffy! First is Steamed Herbal Chicken Drum-lets. 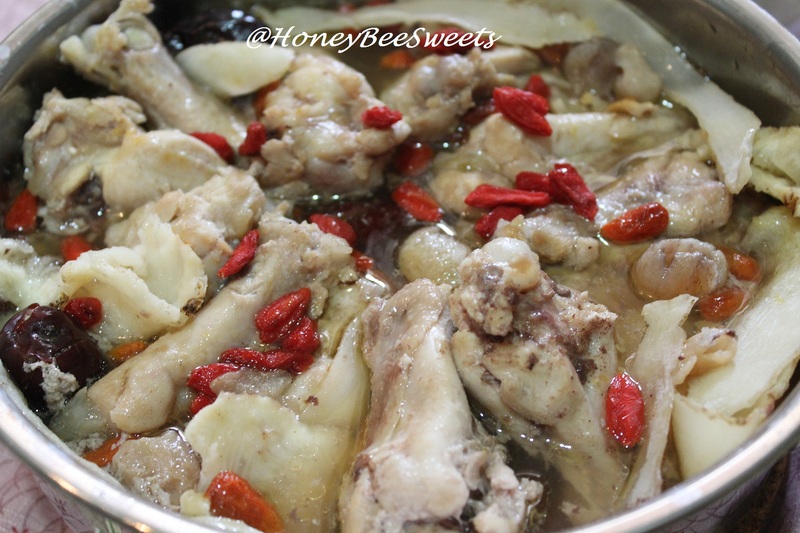 In a mixing bowl, add in the de-skinned chicken drumlets and all of the marinate ingredients. Mix well and cover to marinate for at least an hour. Give all the herbs a quick rinse. 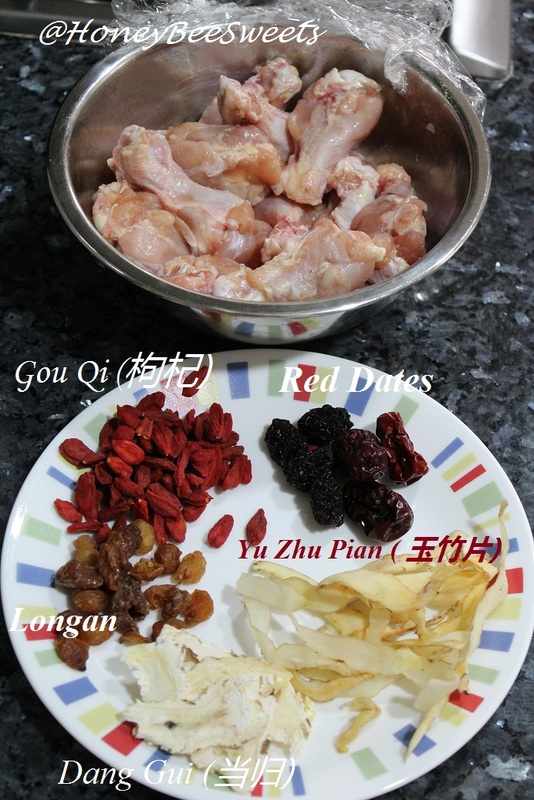 Then in a small bowl, add in all the rest of the herbal ingredients except the Gou Qi (枸杞). Add a cup of water and soak the herbs for 15 minutes, except Gou Qi (枸杞). Meanwhile, set up the steamer. 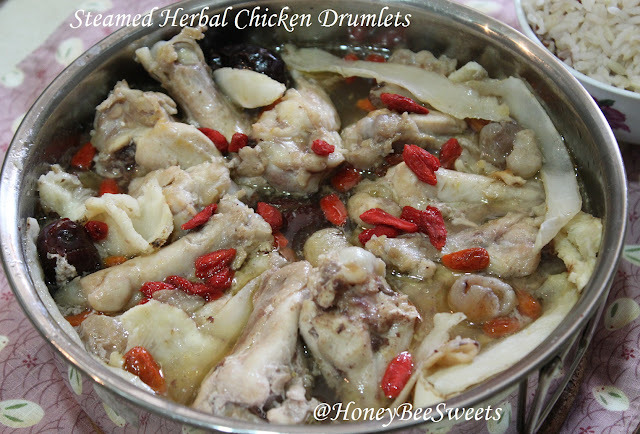 Line your chicken drum-lets in the steamer bowl and pour in the soaked herbs and add the Gou Qi (枸杞) over the top. Steam at medium high heat for at least 10-15 minutes. If you are using whole chicken, steam at least 20 minutes. Once done, remove from steamer and serve immediately with steam rice. Enjoy! Fresh out of the steamer! Yummy! If you are worried that your young child doesn't like the taste, you can add a wee bit sugar to the marinate or seasoning to sweeten it a little. 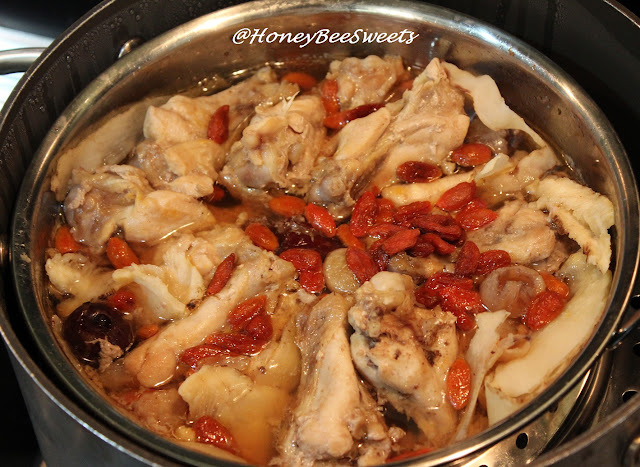 But you know the red dates, gou qi & dried longan makes the dish naturally sweet and yummy already! Okay, gonna keep this a short one, have a great weekend everyone! Back to today's post. It was my FIL's birthday last weekend, so it goes without saying that I had to churn out a cake for his big celebration. Although I was down with flu(recovering), it seems like a bad excuse to the old folks if you tell them I can't bake his cake because I ain't feeling too well. So by hook or by crook, I bit my lip and got to work. I browsed through so many cake books and finally decided on a recipe from this fabulous book from "Le Cordon Bleu (De la Cueillette, a la Recette)" also known as "法國藍帶糕點應用". I acquired this cookbook while I was touring in Taiwan last Nov and fell in love with it. I doubt I will be able to find a copy here in Singapore. I grabbed the opportunity to bake one of the simpler recipes in the book...yeah, Le Cordon Bleu...renowned French culinary school. ~stress~ At some point while I was preparing for this cake...I was asking myself if I was kidding myself to go with this recipe, lol! Anyway, I did made some changes to the original recipe, mainly because of the preference of taste in my family and also the fruit in season. 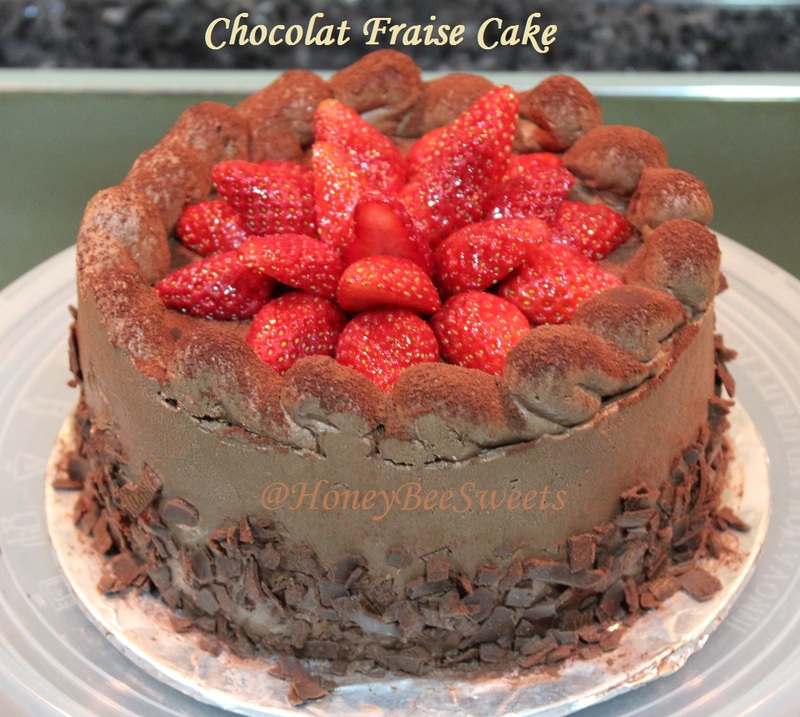 The recipe I choose from the book was Chocolat Framboise, simply mean Chocolate Raspberry cake. It may sound simple, but it's pretty complicated when you read the recipe. It's a cake with layers of chocolate cake also called Sacher, Cremeux Framboise (raspberry cream jelly), Mousse Chocolat (chocolate mousse) and raspberry jam. One of the major change in the recipe is I used strawberries instead of raspberries. I know, it's like a totally different cake! I felt I didn't do the recipe justice by changing this main ingredient. :P But I thought strawberries are in season now and it won't differ that much maybe in taste? 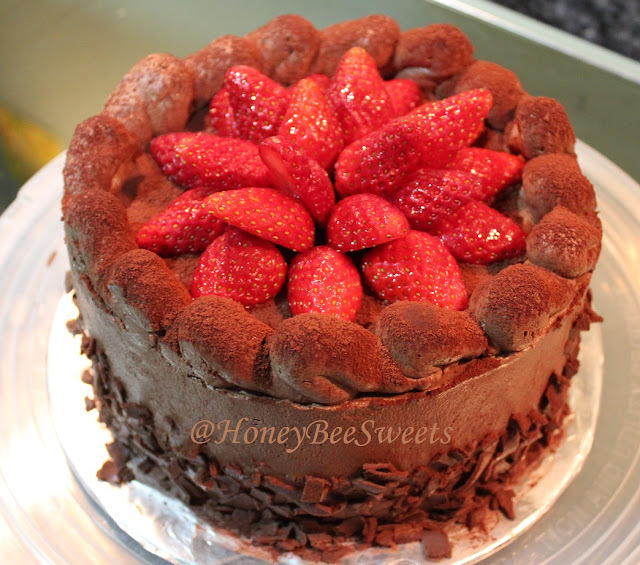 Anyway, I swore I will bake this again using raspberries, just you wait! Lol! 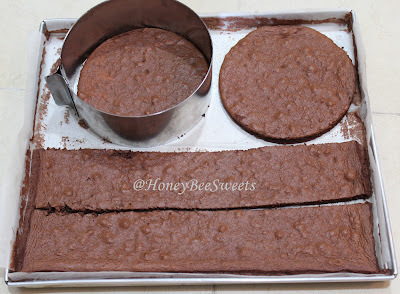 Set the cake slices aside for use later. 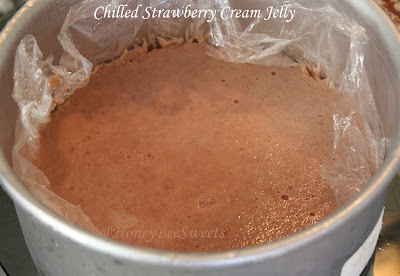 In the meantime, make the strawberry cream jelly layer. In a saucepan, add in egg yolk, whole egg, caster sugar and strawberry puree and mix well. Place over medium low fire and cook mixture till slightly thicken. Add in the soften gelatin sheet and stir well till completely incorporated. Remove from the heat and add in the butter and stir till butter has melted and combined. At this point you can sieve this mixture but I choose not to. To make the chocolate mousse: Beat the egg yolks till foamy, then gradually add in the warm sugar syrup and continue to beat till doubled in volume and lightened in colour. 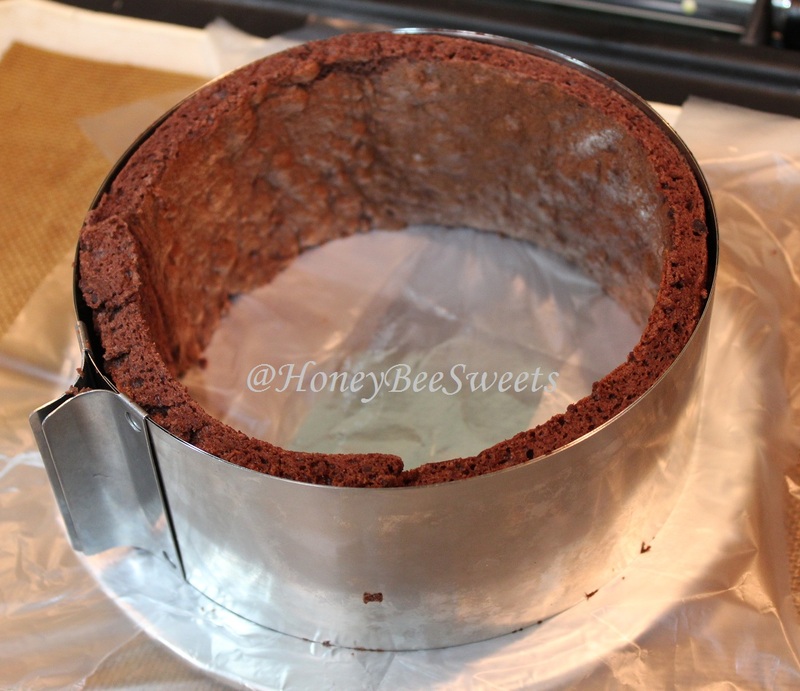 In another heat proof bowl, heat up the 45ml cream till almost bubbly and pour over the chopped chocolate. Let mixture stand for 5 minutes. Then stir well to get a thick chocolate ganache. In a mixer, whip the heavy cream till stiff peaks. 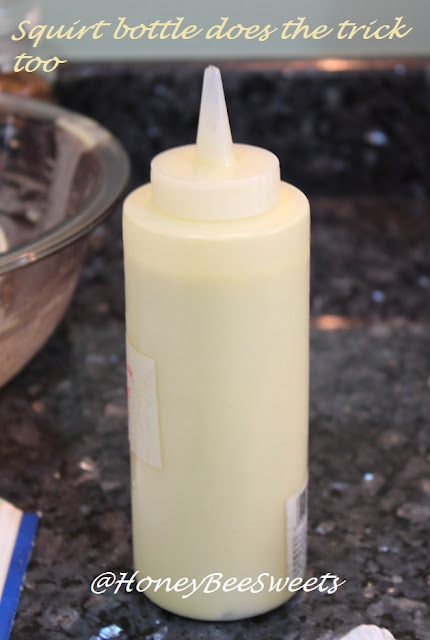 Add half of the whipped cream to the egg yolk mixture. Then the other half of the whipped cream to the chocolate ganache. Then combined both these mixture together till well combined and be careful not to deflate the mixture. Chill chocolate mousse till needed. Assembly: Place the 2 (or less, cut away as per needed) strips of chocolate cake along the inner cake ring. Next place a 7" round cake disc at the base...make sure there is no gap between the cake layers else the mousse will ooze out. Spread some strawberry jam at the surface of the base cake layer...generously. Next pipe a layer of chocolate mousse over the jam layer. Next, place the strawberry cream jelly over the mousse. Make sure the jelly is firm enough to handle. Mine was a little wobbly but I still manage to slide it in ok. Else you can freeze it to firm it further. 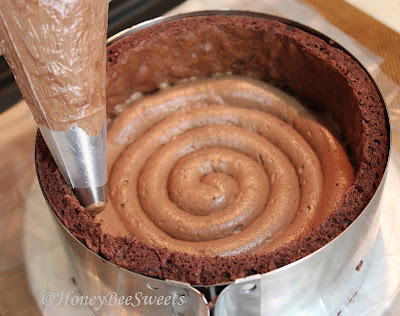 Next, pipe another layer of mousse over the jelly and then place the other cake disc over the mousse. Lastly, spread some mousse over the cake layer and smooth it out. Chill the whole cake in the fridge for another hour before removing the cake ring. You can at this point frost the cake with more chocolate mousse and decorate at will. My goodness...that is a load off! Sorry for being so long winded but these are basically the steps. :P But making this cake is a real experience...loads of work but sure pays off when you take the first bite~! 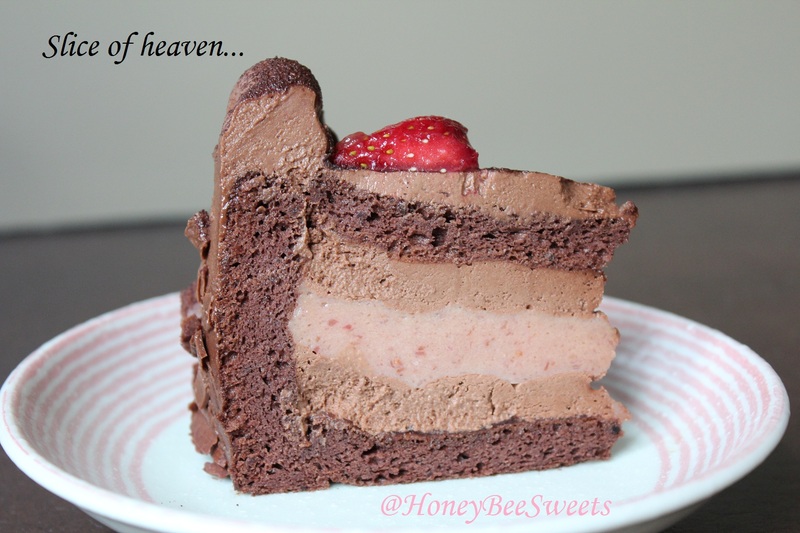 It's funny how sometimes we ordered such a cake and never really notice how all these wonderful and yummy layers that marry each other so nicely! After baking one myself, then I truly appreciate each individual layer much much more, haha! Everyone that tasted the cake liked it, going for seconds and cleaning up their plates in no time. The strawberry did pair off nicely in place of the raspberries, lol! Come-on, you can't go wrong with strawberries and chocolate right? I declare this attempt a successful one! Yoohoo! Looking forward to tryinbg out more challenging cake recipes from this Le Cordon Bleu book....if I dare, lol! If you ever do attempt to bake this cake, do drop me a note/comment and let me know how it turns out ya? There you go! An almost 2 weeks break and I came back with this super long post of a 5 layer cake! Hope I redeemed myself, haha! 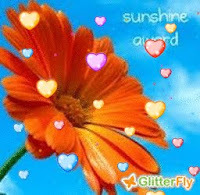 Have a great day all! Another week gone, and I am still slacking! 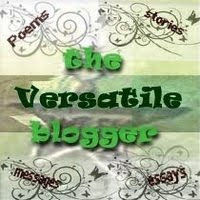 I really need to get my momentum going on my posting. 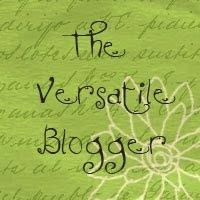 I have not been blogging much but I have been more active on my new "passion"....Instagram, lol! If you are too an Instagram user, do come look for me and search for "honeybeesweet88" and you will find me. :P Do drop me a comment if you find me there ya? Boil the potatoes in a pot of water till it is fork tender. Scoop out and mash well. Then mix together with the rest of the ingredients and set aside for the buns later. 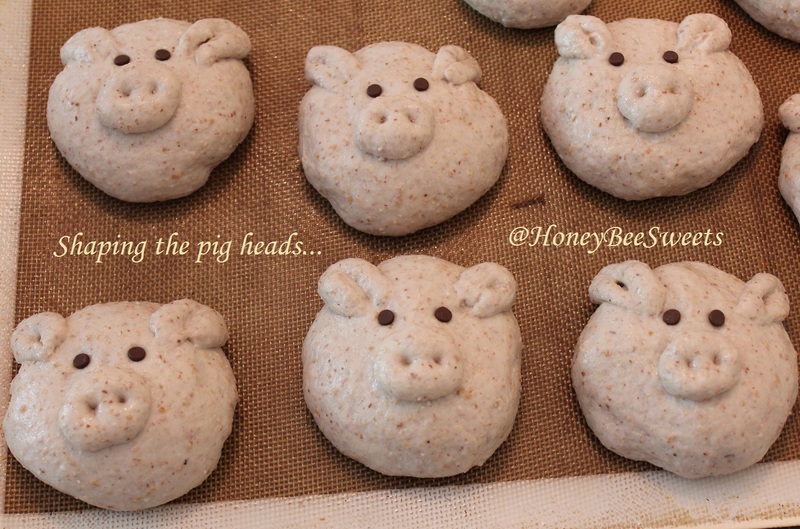 First take the pig head, take a 50g portion and roll flat into a flat disc shape. Place one cheese square at the center, then 30g of the filling over the cheese. Seal up the edges into a roll ball.Then using your palm, press it down slightly to make it a slightly flat for more face "area". Take the 18g portion, divide into 5g, 5g & 8g. The two 5g are for the ears and the 8g for the snout. 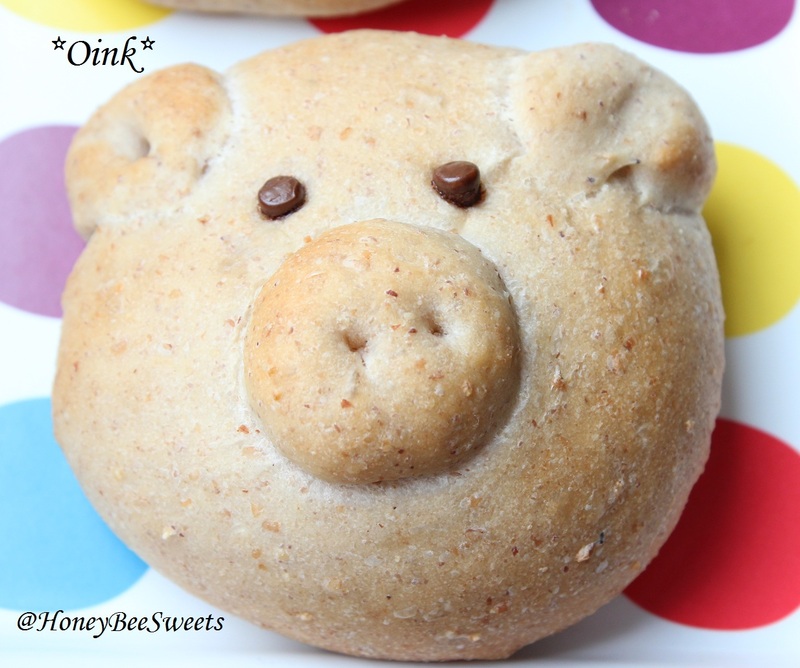 Roll round and stick the snout and ears on the main face dough surface. Using tooth pick, dip it in some cooking oil (prevent sticking) then poke the nose to create the nostrils. For the ears, use kitchen scissors to snip the lower end to create an opening. Lastly stick 2 mini chocolate chips above the snout to make the eyes. Let it proof for at least 15 minutes and preheat the oven to 175C. Then bake these buns in the preheated oven for 13-15 minutes till slight golden brown. 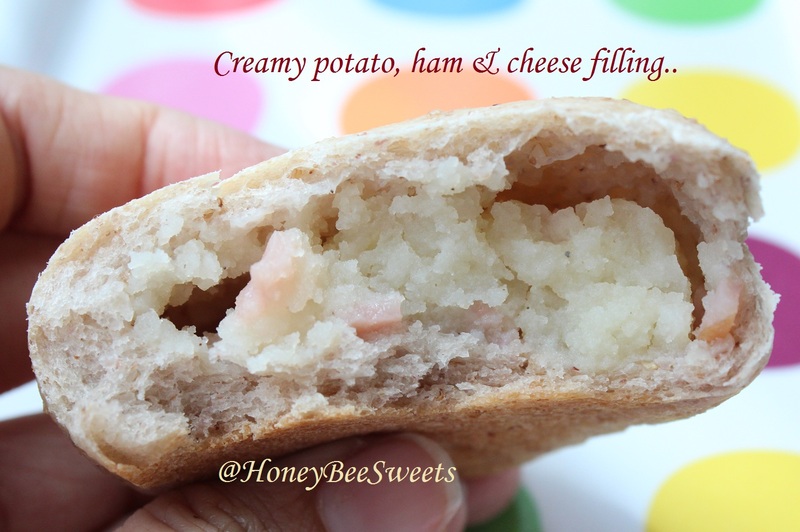 I really love the filling! I wondered why I never use that combination before, lol! 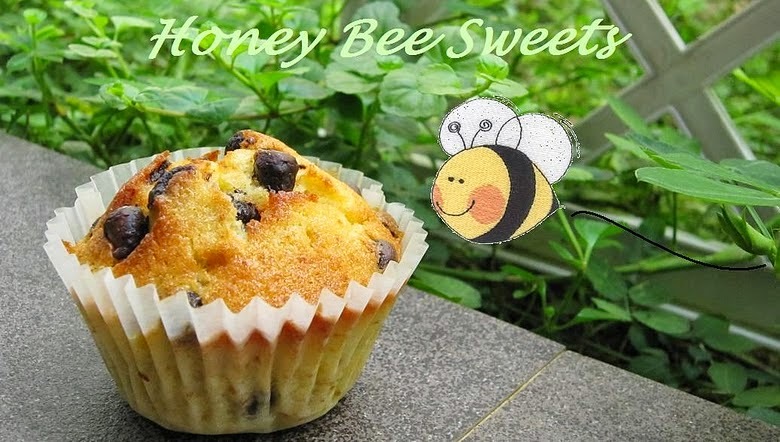 Hope this recipe will also become a favorite for you and your family too. And have fun baking those piggy heads too! :) Have a fantastic day everyone!